The history of sanctions teaches us that they are like a pole – you can find a way around them, and in the process, find a niche market for all kinds of smugglers, gangsters, and political types, as co-operation is needed at all levels. For this reason, sanctions often have the opposite effect to that intended, and make “bedfellows” of the least likely of stakeholders. You would think the US, in all its wisdom and experience, would have learned a few lessons from previous attempts to use sanctions as a political lever. After all, it did not take Tehran long to establish a well functioning network of financial institutions and oil-smugglers to keep it supplied with foreign currency and needed goods and services. The first ever UN-imposed international sanctions were against Rhodesia after it declared its unilateral independence in 1965 without granting the black population majority rule (Security Council Resolutions 232 and 253). Only South Africa and Portugal officially ignored those sanctions, for their own very different reasons. Fifteen years later, when the white regime finally fell, even the black population of Rhodesia still had one of the highest standards of living in Africa. As David Baldwin writes on the logic of sanctions, there is a divide between the policies the policy makers, as “policymakers continue to use sanctions at an increasing rate, all the while scholars continue to deny the utility of such tools as foreign policy.” The bottom line is that they don’t work, and inflict more harm than good, especially on that segment of society which is most vulnerable. This becomes an issue when millions of people are enduring austerity programmes being inflicted on their countries, which have the same seemingly obvious logic behind them, have begun to attract the same scholarly criticism, and produce exactly the same negative results. The UN is now conducting an investigation into why the United Kingdom, one of the richest countries on earth, treats its poor and vulnerable so harshly. The British claim this is financially necessary, but if the UN says the UK can balance its books another way, this can have far-reaching consequences for the intellectual basis of imposing sanctions. Faced with such failures, the United States is trying to run away by crying wolf. It claims that an illegal scheme is in place to support Syrian President Bashar Assad, and provide financial assistance to Hezbollah and Hamas, by selling oil. This is being used to support the imposition of further sanctions. But if it were not for sanctions, why would such relationships exist in the first place, assuming they do? It is no secret that oil is being sold illegally, and has been for generations. That is why Trump can make these allegations. Enemies equal illegal activity, so if something bad is going on, the people we don’t like must be doing it. But who is actually involved in this business? The big players are not enemies of the US but its own strategic partners. US Secretary of State Mike Pompeo has said that there will be grave consequences for anyone who is supplying oil to Syria or trying to circumvent US sanctions against the Islamic Republic of Iran’s terrorist activities. But when it comes to locking up the politicians and proxies who did this regularly with US protection, such as Mikheil Sakkashvili and his uncle, these sentiments fly out of the window. On November 19th an associate of mine, and an American with a Persian grandfather and ethnic Georgian roots, together witnessed a convoy of Iranian oil tanker trucks with Persian language license plates heading to the Turkish border in broad daylight. No effort was being made to hide the country of origin of these trucks, which travelled three to a group, or what was obviously the cargo. 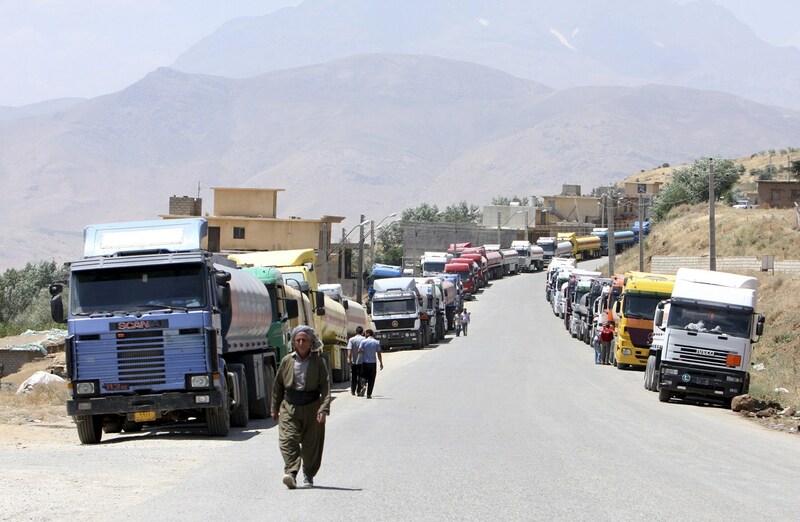 The drivers were not concerned about US sanctions, or worried that the Georgian authorities would detain them or confiscate their illicit cargo. Many of these trucks were ancient American made GMC models, dating back to the time when the US and Iran still were on good terms. This smuggling has been going on for years, and explains in part why so many Iranians are living in Georgia, albeit some with Georgian roots. These so-called sanctions will bring more and more money to these smugglers, and the Americans who stand behind them. For many Georgia is a safe haven, because whatever it does, the Americans have its back, as the world saw during the Saakashvili years. Georgia is basically a free and open society, or so the West keeps telling the locals, who have always had to watch what they say and who they say it to. But all that does is provide cover. The opportunity to make money off sanctions is what has driven a succession of semi-educated nonentities, who very few electors recognise or trust, into politics in the first place. US continues to lie about Georgia, and other countries where the same happens, give them the opportunity to make fortunes off sanctions by helping establish the complicated mechanisms needed to circumvent banking controls and providing other goods and services to Iranians. Turkey has also already proved, in its dealings with Kurdish and stolen Syrian oil, that business comes first and NATO membership and fighting terrorism second. It has few, if any, scruples about allowing business to continue as usual, as cutting off the proceeds of oil is not a high priority when they keep the political class in power, and everyone else in their place. The US is very fond of intervening to achieve regime change. If it has a genuine beef with a given country, it is happy to show it who is boss the old fashioned way. It is therefore no coincidence that Syria and Iran are now being held up as suitable sanctions objects: the US has tried to make its writ run there, and failed, so now wants to pretend to be attacking these countries through sanctions, whilst using them to make the funds needed to try again another day when it might stand a better chance. Sanctions worked to some extent in Cuba, as they did impoverish the population. But they did not achieve the objective of bringing Castro down, because he was able to show them for what they were – actions you take when you can’t win militarily, as the Bay of Pigs demonstrated. They also made the impoverished ever more dependent on Castro, like it or not, and tightened his grip on the country. But they were nevertheless a job creation exercise, and money making scheme, for chosen suppliers who fuelled conflict throughout Central America in the name of ridding the region of communism, or more precisely, maintaining US control over local economies, sanctions or no. In 1980 the US and some other Western governments boycotted the Moscow Olympics and imposed a grain embargo in protest at the Soviet invasion of Afghanistan. This did absolutely nothing to help the Afghans, who have endured practically unbroken conflict ever since. When the Soviets first moved in, Harold Macmillan, the elderly former British Prime Minister, declared that this was the worst thing the Soviet Union had ever done because no foreign power could ever conquer Afghanistan. He was proved right, and Afghans often claim that their resistance is what ultimately destroyed the Soviet Union, an outcome unthinkable at the time. Jimmy Carter had better advisers than Brezhnev, so didn’t go in himself. But he put in train the gun and drug smuggling operations which still exist today, the same ones used by Daesh and al-Qaeda, to ensure that the resistance would become another subsidiary of the US military-industrial complex, but an off-the-books one. The US motive for imposing a new round of sanctions on Iran is still unclear. But it is unlikely to have much to do with trying to get Iran back to the negotiating table. As Al Jazeera reports, there is a gap between the rhetoric and reality: given the severity of the sanctions, the list of conditions from the US and the tone of the Trumpian rhetoric, the question is if the White House is really looking to create dialogue or confrontation? What is not mentioned is that Yemen’s problems are the result of the US taking it over to illegally supply arms to real terrorists, (Saudi Arabia and its proxy fighters). All the while Iraq can only have the democracy the US allows it to have, which is designed to keep the terror supply gravy train in place, that the US destroyed prosperous Lebanon for doing things differently and succeeding at it and Assad is still there because the US can’t defeat him, and Iranian help should not make any difference to that. A country like little Georgia has no choice but to go along with sanctions in both directions. On the one hand, it must support the US position to the letter, in public. On the other, it must allow itself to be used as a supply point for all the illegal sanctions-busting activities, as actually imposing sanctions would result in much worse being done to it. Georgia is allowing its territory to be used to supply oil which will be sold to support Hezbollah. It takes a share of the proceeds, but a big wedge also goes to the owners of the oil terminals used, who are mostly still Saakashvili clan members. Thus the smuggling is used to control all the country’s politicians, and their destinies. Hezbollah is classified as a terrorist organisation by the US. If these smuggling operations continue, Georgia will be aiding and abetting a terrorist organisation. Thus it will be considered a state sponsor of terrorism. Hence be subject to sanctions itself. But if it doesn’t go down that road another country will be found, and the proceeds and goods of that trade used against Georgia itself. The sanctions against Iran actually strengthen the standing and reputation of the Mullahs, as they can claim that all they have been saying about Satan America and its allies for all these years is true. This means that the people suffer the most, as they cannot engage in political activities to bring about change in Iran. If the US wants to change anything in Iran and Syria, it should ensure their peoples gain more from the US than from their own governments, as they did in Peace Corps days. But why does it want to do that, when imposing artificial sanctions create more profit and control opportunities, at least for some, than legitimate trade? Posted on The Iranian originally from New Eastern Outlook.